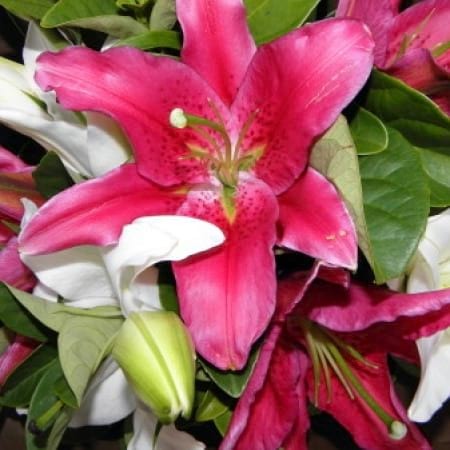 Amaranthine`s Oriental Lily Bouquet is a beautiful long lasting gift. The sweet smell of the Oriental Lily fills any room. Their long lasting quality and classic style make them a stunning gift every day. Oriental Lilies mixed in both pinks and white and lush green foliages, gift wrapped in our fabric paper are a perfect way to say, I love you, Happy Anniversary, Thinking of you, Happy Birthday or Just Because. A timeless choice in blooms from Amaranthine Flowers By Design Newcastle available for same day delivery available to all areas of Newcastle, Lake Macquarie and Maitland. Including John Hunter Hospital, Newcastle Private Hospital, Lake Macquarie Private Hospital, Maitland Hospital and Mater Hospital. Include a message on our complimentary gift card or enhance your flowers with one of our fantastic add-on gifts, your selction of chocolate, wine, bears, balloons, candles and many more.